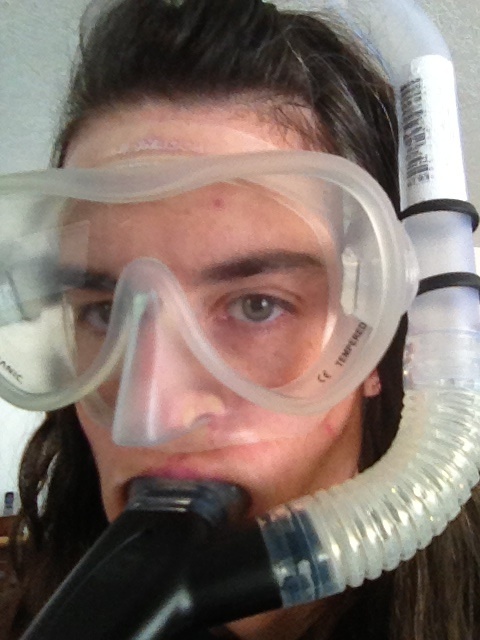 I started my scuba diving class. I loved it. Water is a whole new world of exploration... I haven't even spent much time playing in a pool, and the thought of exploring lakes, rivers, and the oceans UNDER water sounds amazing. Just think of all of the cool things I can see! I tried to smile for the picture. I had to swim. I had to use a snorkel, fill it with water, then blow it out, so I could keep breathing. The fins caused me issue, because I got stepped on by a horse this week, so I finally took them off. It's hard to swim with a big tank on your back. We learned how to clear the regulator. (It fills with water when you take it out of your mouth underwater. If you just put it back in and start breathing, you'll breath water.) We had to do that several times, and show we knew the different methods to clear it. Then we had to flood our masks and clear our masks underwater. Having water in the mask made it so I couldn't see, and that caused me anxiety. I had a hard time thinking when I couldn't open my eyes... The instructor worked with me for about five minutes before I could (somewhat calmly) fill the mask with water, and then clear it. Before class, I was a little bit worried that PTSD/anxiety/panic would make diving miserable (for me, and anyone with me). I'm not worried anymore. Before I go on a real dive, I'm going to have to get more comfortable with water in the mask, but I am confident with just a little more time and practice, I'll be past the anxiety. I'm going to have to invest in a wetsuit or something. (I hate spending money, but I have learned that spending money on the right gear makes experiences so much more enjoyable. Something about freezing makes it hard to enjoy anything.) The pool was 80 degrees, and by the end of class I was shivering so bad I couldn't turn the knobs on the oxygen tank. I totally need to learn how to clear the mask underwater. I've obviously never been diving, but even in snorkeling I get water in the mask. I always have to come up to clear it out. I do know how to blow out the snorkel, but I don't know if that's the same as blowing out the regulator. I'm glad you're having fun. That sounds super cool. To clear the mask underwater, you push on the top of the mask, and then blow out your nose. Blowing out the regulator is very similar to the snorkel, except the regulator also has a button that will do it for you if you want to do it that way. AND I still think you need to get certified too, so we can go on adventures together. I support aqua Jen, she seems like she'd be fun to hang out with as long as I don't blind fold her or anything, but why would i? Thank you for not blindfolding me in the water. Actually, thank you for not blindfolding me at all. I learned that water moves heat away from the body at a rate 25 times faster than air. So, even if the water is warm, you'll get cold a lot faster. I don't like cold water either... I feel like I can't breath even when I know I can.